I'm sharing a collection of favorite Onesie Makeovers that I first found on Pinterest and pinned to my board Nanny's Kids - Sew Much Love. There are so many good ideas out there, but it takes time to search for each one and evaluate them. Are they tutorials? Are they just photos with no directions? I love to sew and craft. Personally, I like a good set of written directions with photos. All of these sweet little projects are easy and come with great written directions. You'll find links to my pins (in the title) and links to the original websites (in the caption and on the photo) where the details and instructions are posted by the geniuses who created them. I spent a lot of time developing this collection. Hope this Best of Pinterest Onesie Makeover Collection is a timesaver for everyone out there looking for instructions and ideas. 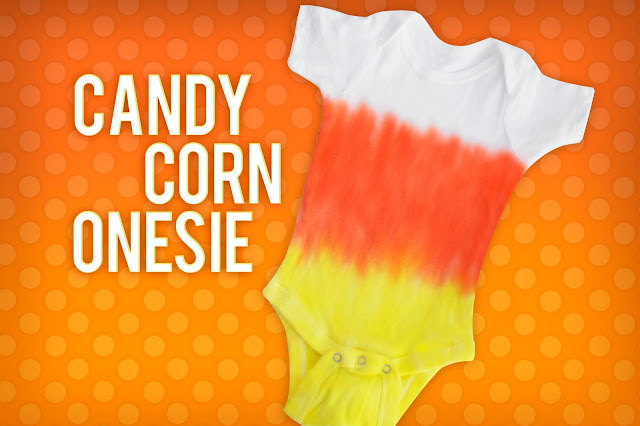 This No-Sew onesie reminds me of Fall and Halloween. The colors could easily be changed for other seasons - pastels for Easter or Spring, reds and pinks for Valentines, etc. It would be cute for a boy or girl. This dressed up Vest and Tie Onesie is perfect for photo-ops, church, or any other reason you choose to get the little ones all gussied up. It is actually an applique she created with fusible webbing and fabric from a soft, well-worn man's shirt. 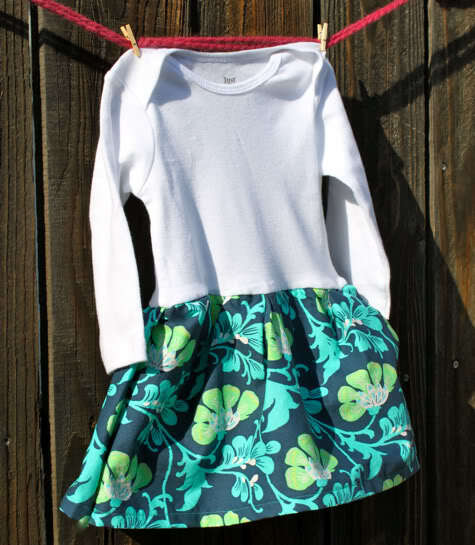 This 10 Minute Onesie Dress is by Jaime of Prudent Baby. It is really very easy to make. There are so many different fabric and embellishment options available for this one, the only trouble you'll have it trying to choose the one you like best. I call this the Bow Tie and Suspenders Onesie. Tiffany created it and she refers to it as the "BABY NERD SHIRT". So sweet and easy to make. I think it would be perfect for church wear, parties, etc. 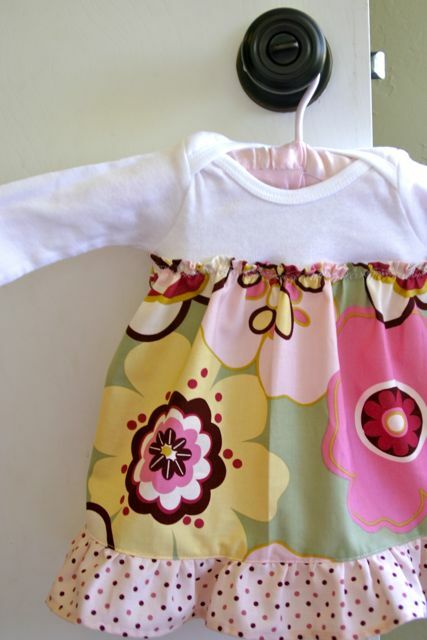 This Bubble Dress Onesie is very easy too. It is a bit different than the 10 Minute Onesie Dress, because you actually cut the snap bottom off the onesie when you add the skirt. The flower embellishment that matches the skirt is the perfect complement to the dress. The Shirt and Tie Onesie is so easy and the post includes a pdf pattern for the tie. Just use Wonder Under to attach it, sew around the edges, and you're done. You could make two or three of these at the same time to match different outfits. This Ruffle Bottom Onesie is so sweet. I love ruffles on girls, don't you? What makes it so easy is the use of organza ribbon to create the ruffles. By using ribbon, the edges are already finished and they don't fray. Genius! This Football Onesie makes me smile. Just pinned it today! The part I like best is that this is a No Sew Onesie. You won't believe how easy it is to make till you read the instructions! I think Onesie Dress was actually my first Pinterest project. It was definitely the first dress I made for my own sweet granddaughter, TINKERBELL. I wish I had a photo to post for you. We used purple Disney Tinkerbell fabric for the skirt and that purple minky fabric from Hobby Lobby for the ruffle trim. It is adorable, just like this little dress. I hope you enjoy this collection. Please let me know if you are inspired to make one. I have another grandson on the way and I just can't get my mind off baby stuff. Babies are the best, especially grandbabies! Babies, WOW! That is some neat upgrades.